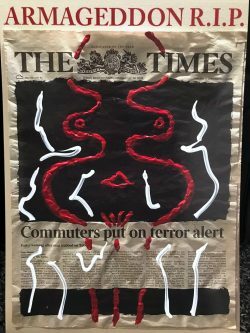 FROME-based artist Barry Cooper, whose work has always had a strong political element, shows a new exhibition, Armageddon, at the Silk Mill at Frome from Good Friday, 19th April to Thursday 2nd May, daily from 10am to 6.30pm. The new show features redacted front pages of national newspapers from 9/11 (11th September 2001) to the present day, in an environment constructed from on-going studio creations, together with work from previous decades, after the artist’s supposed demise. The exhibition is collated and hosted by Kate and Damon Moore with Craig Eyles. All work will be for sale by silent auction with 50 per cent of all proceeds going to Fair Frome. The event will also feature the premiere of Intervention by composer Luke Deane, who studied piano and composition with the Frome-based jazz pianist John Law in Frome. Luke went on to study composing at Birmingham Conservatoire with Howard Skempton, and in with Richard Ayres in Amsterdam where he now lives and works there. This year, Luke has been working on a completely autonomous, experimental television show, and invited Barry Cooper to Amsterdam as featured special guest in the first episode of DeepFreezeTV, which was co-created by a team of 15 international artists.